The BBC’s Doctor Who is one of TV’s all-time top sci-fi series, and has a world-wide following in the millions. 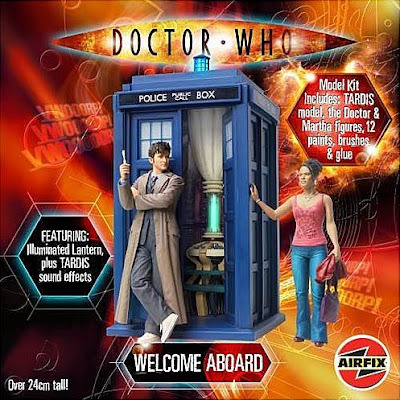 All the better then, for a sale of Doctor Who items at Amazon, which features a pair of gift sets from Airfix at more than 70 percent off the normal price. These are a little unusual for Doctor Who memorabilia, as most items on sale out there are ready-builts of one sort or another. 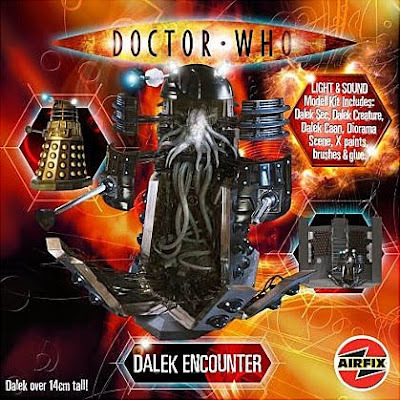 The Airfix duo Welcome Aboard and Daleks in Manhattan (video clip shown above) include paints, brushes and glue - just right for whiling away a few of these dark November nights. Even better for this reviewer, sound and light effects are included in both sets, which should really bring these dioramas to life. They’re a good size too - at 1:12 scale, the Doctor’s TARDIS* police box measures more than 240 mm (9.5 in) high, while the Dalek is just over 140 mm (5.5 in). * Just in case you didn’t know, the name for Doctor Who’s blue transporter vehicle is an acronym for Time And Relative Dimension In Space, and it’s based on an old-style British police box. So that’s all right then - IWOOT! Visit the featured pair, plus other Doctor Who items here.